The Rollie Pollie is made of mahogany pods, colorful corn husk, bamboo and Abaca. 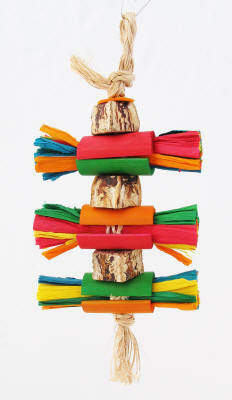 It can be used as a foraging toy by hiding treats in the corn husk bundles. Photos don't do this toy justice ... it has many layers and textures for your feathered family to enjoy! Topped with a natural Abaca loop for easy hanging.